It is not a secret that every child needs to be motivated in order to achieve its full potential. You cannot just leave your child be and hope for the best. As a Christian parent, you need to do your part and make sure that your child has inner motivation to do the things that are right to do. I know way too many parents who are tired of constantly telling their children to do house chores or of telling them to stop fighting with their siblings. They simply don’t know how to motivate their kids to behave like Christians, but I would like them to know that there is hope and help in the form of a book that can completely revolutionize their concept of parenting. This is one of my favorite books on Christian parenting and it is completely based on Biblical principles that are never outdated. If you are tired of telling your children the same things over and over again, you will be relieved to know that things don’t have always to be like that. It is possible to have happy and motivated children without too much struggle. The book is written in such a way so that parents are aware of all the things they can do in order to make their children motivated and happy. This way they will be prepared for life and they will be ready to face the challenges of life with open arms. They will have a way of discovering that life is fun and that there are many ways to handle every situation and emerge victorious after it. 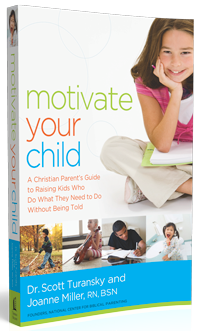 Pre-order or purchase a copy of Motivate Your Child from any retailer. Once you’re made your purchase, follow the instructions below. Click here for some common retail options. INSTRUCTIONS: Purchase the book. Send an email with MYC150 Promo in the subject line with a receipt of purchase to [email protected]. Biblical Parenting will send you the link and a special code to access these downloadable video, audio and written products. Thanks for the great review. I also love this book and believe that more parents need to hear about this revolutionary approach.